Welcome to River Crossing Club's Golfing Experience. River Crossing Club is located in Spring Branch, Texas, conveniently located just 15 minutes north of San Antonio and 40 minutes south of Austin. Panoramic views offering the serene beauty of the Texas Hill country, along with excellent golf course conditions make for a great golfing experience. River Crossing Club is a private club for Members and their guests. Enjoy the exclusive opportunity to play one of San Antonio's finest private membership courses with Southern Breeze Golf Tours. 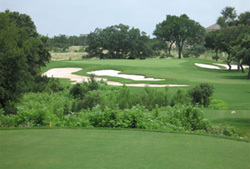 Always considered one of the best maintained courses in this part of Texas, River Crossing Club is also known for being one of the most playable courses. It's a perfect balance of challenge and forgiveness that provides one enjoyable round after another. This 18-hole championship golf course, nestled in the rustic beauty of the Texas Hill Country, was recently voted as one of the most well-maintained golf courses in the San Antonio area. Golf Week (Texas Golfer publication) rated River Crossing Club "13th best course in the state" and The San Antonio Business Journal rated River Crossing's course as one of the “3rd toughest private courses in the area." * This club can exceed $100 for weekend play - Friday thru Sunday.